FIFA General Secretary Jerome Valcke is concerned by the slow progress at Curitiba stadium. FIFA Secretary General Jerome Valcke has warned Brazilian World Cup organisers that they only have a few more weeks to demonstrate that the stadium in Curitiba will be ready in time for the tournament. Valcke is concerned about the pace of construction at the Arena da Baixada after visiting the southern city on Tuesday. He said he believes the stadium will make it, but refused to guarantee it will be part of the tournament that begins in June. Valcke said local organizers have until February 18 to demonstrate that the work can be completed in time. ”What we are expecting is that these technicians will work from now up to the 18th of February and by the 18th of February they will say, ‘OK, guys, it’s fine,”’ Valcke said. Most of the delay at the venue, which was about 90 percent completed, was blamed on difficulties getting the funding for the construction. The stadium is being built mainly by local club Atletico Paranaense. Moreover there have been walkouts by the workforce unhappy at the conditions they have been forced to work under. Brazil’s deputy sports minister Luis Fernandes said that after Tuesday’s visit it was clear something had to be done to guarantee Curitiba as a host city. ”With the current pace of construction, the stadium would not be ready in time,” Fernandes said, adding that more workers are expected to be added to the construction site to try to get the venue ready. Australia is scheduled to play defending champions Spain at Curitiba on June 23. On Wednesday, Football Federation Australia said it was concerned and will contact FIFA for guidance. ”The prospect of matches being moved from Curitiba raises serious concerns, particularly for Socceroo fans who have secured tickets and made flight and hotel bookings,” an FFA spokesman said. 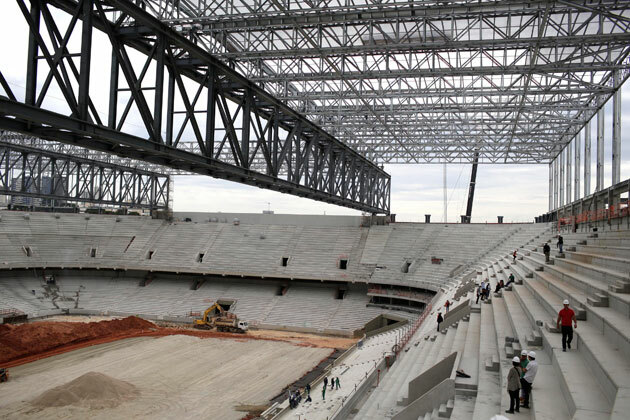 Curitiba’s Arena da Baixada is the most delayed among the six that still have to be delivered for the World Cup. FIFA’s inspection tour began on Monday in Sao Paulo, with Valcke visiting the Itaquerao stadium, which will host the World Cup opener between Brazil and Croatia on June 12. Brazil promised to deliver all 12 by the end of 2013 but only the six that were used during last year’s Confederations Cup were ready.